I've been able to save $45 within a month at the grocery store. It wasn't due to coupons or store gimmicks. It was because I've been growing my own celery in my Eco Garden System, a self-watering raised bed. I’ve been treating the celery as "cut and come again" — as one would do with lettuce — which has provided me with a continuous supply for my hungry rabbits. The trick to growing successful celery is providing consistent moisture, since celery is a heavy feeder and likes to be wet. If celery is not wet, its stalks will be dry and small. That's not the case with my celery! The celery stalks are huge! 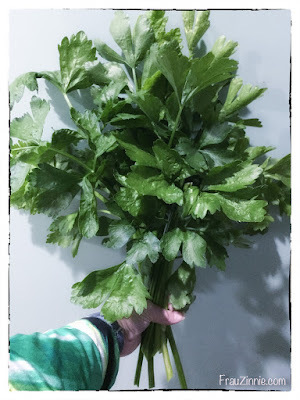 At one point I had a very nice looking bouquet of celery that I considered putting in a vase and admiring instead of feeding to my little beasts (see the photo above). It's been easy to grow the celery without worrying about if it gets a constant supply of water because I know the water reservoir at the bottom of the Eco Garden System helps to keep the plants' roots happy. In fact, if there is too much water in the reservoir, there's a way for it to drain so the plants are not at risk for drowning. The water can escape through an overflow valve (shown at right) or through a spout, which can be used to empty the water from garden at the end of the season. 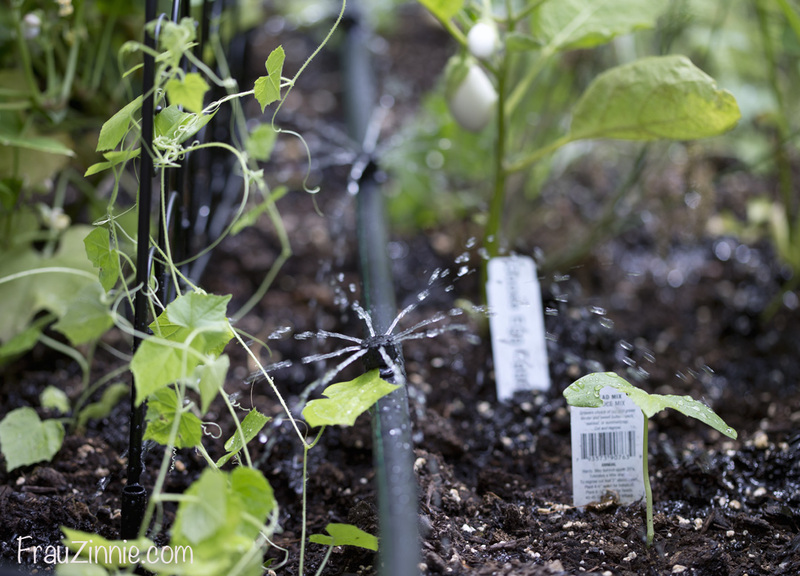 As for regular watering, I have only hooked up the unit about five times to my garden hose so far this summer. Why not more? 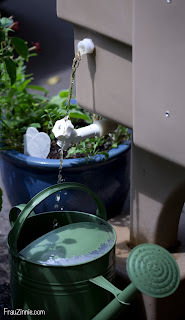 I believe it's due to a combination of the unit collecting rain water and storing it in the water reserve underneath the plants, as well as the unit doing a remarkably good job of keeping the soil moist. 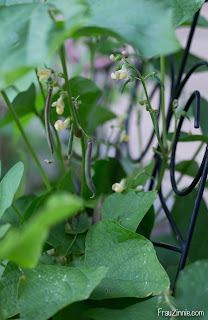 We’ve had some very hot days in July, and while the rest of the yard has been wilting in the heat, the Eco Garden has held up really well, mainly due to the water it conserves. (A bonus considering that it sits on top of black pavement in my driveway, which also gives off heat!) 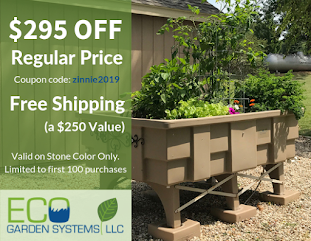 Even though the unit does a great job of keeping the soil moist, and can distribute the water through the tubing and sprinkler heads, water in my area is a bit expensive, so if I don't have to water, then I'm a happy person. 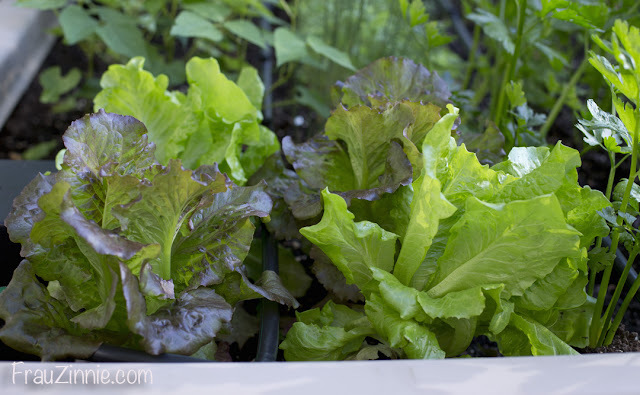 Lettuce (from plant starts): In my original post, I shared some photos of very good-looking heads of lettuce (also seen above before I harvested them). When I harvested my lettuce there was a sizable gap left, so I planted a 'Goose Egg' eggplant I got on sale at my organic gardening center. I also planted the seedlings I started in June of Mexican sour gherkin plants (from Hudson Valley Seeds), which will take 75 days to reach maturity. 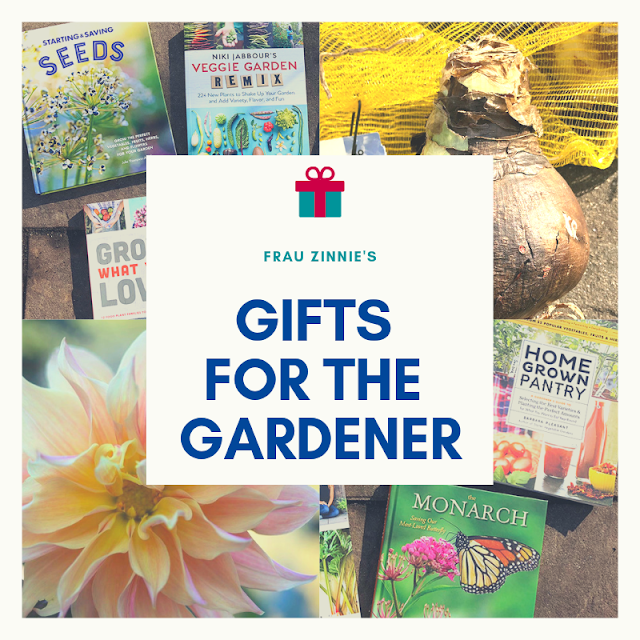 In mid-July, I also decided to add marigold seeds ('Lemon Drop' a French marigold from Botanical Interests that will grow 5 to 8 inches tall); and cucumber seeds ('Bush Slicer' from Renee's Garden) which has a estimated 55 days to harvest. Mexican sour gherkin plants (left) and eggplant and cucumber plants (right) benefit from the self-watering featuring in the Eco Garden System. Bush beans (from seed): I decided to grow 'Red Swan Beans' from Hudson Valley Seed Library. 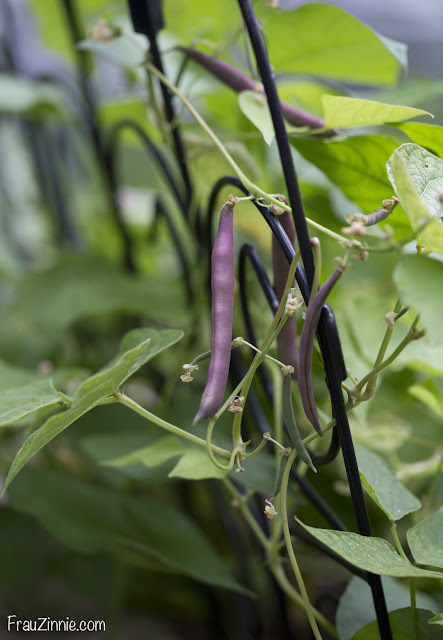 I was able to insert short garden trellises into the Eco Garden that helped support the bush beans, but were not so large that it would puncture the water barrier that separates the soil from the water reservoir. 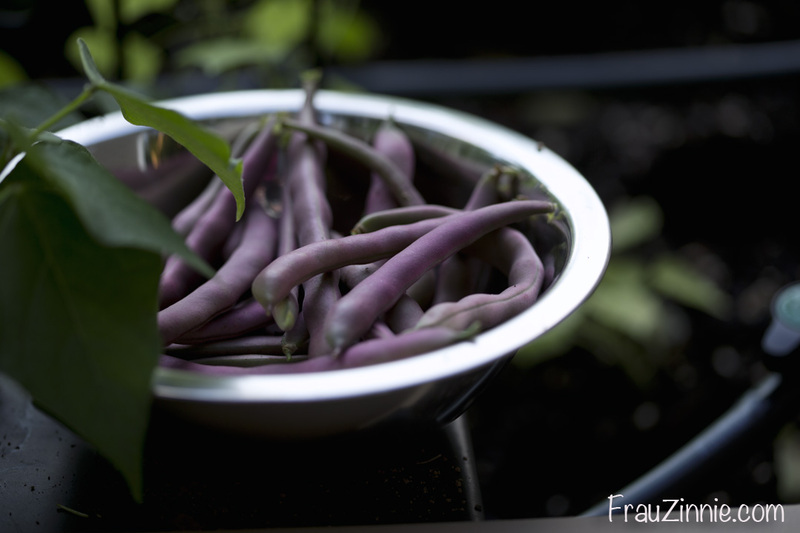 The bush beans grew quickly and I was able to start harvesting them at the end of July. Carrots (from seed): I chose to sow 'Short Stuff' Chantenay Carrots from Renee's Garden, a variety that will take almost 75 days to mature, and as I've been thinning the crop I've gotten a peak of what's below the surface. So far I have tiny carrots that are about halfway into their life cycle. Kale (from seed) and herbs (from plant starts): The kale I grew from seed grew so fast that I had a hard time keeping up with thinning it. The small parsley transplants have increased in size as well. Both were planted near the carrots in the Eco Garden System. So, what’s next? 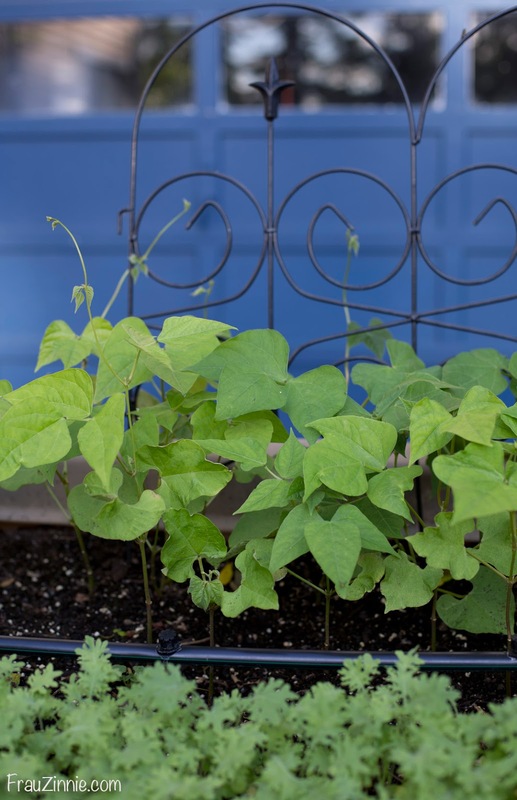 It’s time to plant for fall! As I've been harvesting celery and kale, I once again have gaps in my Eco Garden System, so I'm planning to replant my raised bed for a fall crop, which means choosing varieties that mature quickly (55 days or less). As the length of daylight shortens, I will most likely include lettuce in my fall gardening plans. 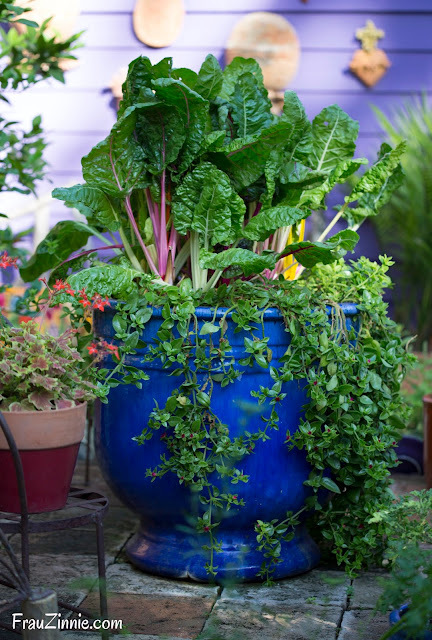 Want to read more about the Eco Garden System? Read my first post on setting up the unit, or watch the short video below.